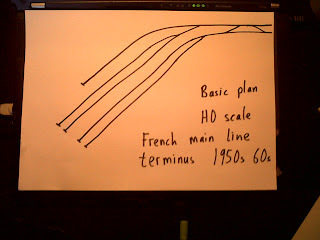 OK, this is the first episode of my blog "Frenchmodelrailway.com". Thanks to Scott Clarke for setting up the blog on the internet. The last time I touched a model railway was in the mid-1960s so this project is quite a departure (unintentional pun) for me. Also, to make matters worse, I have few DIY/technical skills or experience (or inclination). But, I do have a great desire to build a French Model Railway. Why? Because I love France and want a little model of France in my abode. Until a couple of months ago, I had no track or rolling stock. Then I started buying relevant locomotives and carriages (and some HO scale trees! ), firstly from the internet but also when on a short vacation in the Alsatian city of Mulhouse in north eastern France. 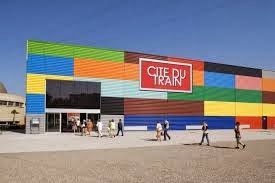 We visited the famous 'Cite Du Train' museum in Mulhouse and there happened to be a model railway exhibition there that weekend with associated stalls selling model train stuff. So, I had some toys but no track to run them on. Now the serious stuff begins - building the layout. The layout will not form a loop; the trains will not go round and round. 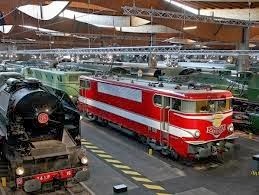 Rather, I want to create the atmosphere of a busy mainline railway terminus somewhere in France approx towards the end of the 1950s beginning of 1960s. Hence, the station will dominate the layout and the layout will be as in the above diagram.